8 Indigeneity in the Courtroom: Law, Culture, and the Production of Difference in North American Courts. New York: Routledge. Jennifer Hamilton, assistant professor of legal studies and anthropology, received her BA in Anthropology and English Literature (McGill University) and her PhD in Anthropology (Rice University). She is a cultural anthropologist who is centrally interested in how ideas of difference shape institutional forms, and how they influence individual and social subjectivities. In particular, her work centers on the question why and how, and to what effect, human difference—including understandings of race, gender, ethnicity, ancestry, genetic variation, and population—has come to occupy a central place in our current understandings of law, ethics, and biomedicine. She is the author of Indigeneity in the Courtroom: Law, Culture, and the Production of Difference in North American Courts (Routledge 2009) and is currently writing a series of articles based on her post-doctoral research project, The Vitality of Difference: Post-HapMap Ethics and Genomics. Her next book project, tentatively titled A Place to Stand: Law and Science in a Post-Genomic Age, explores the dynamic tension between science and law through an investigation of legal standing claims in US courts. Her teaching and research interests center around the social studies of law, science, and biomedicine; critical bioethics; the politics of indigeneity; theories of culture and identity; and critical race and gender studies. Discussant, Marilyn Stathern: “Gifts that Money Cannot Buy: Anthropological Perspectives on Money and Organ Donation,” Department of Anthropology, Mount Holyoke College, South Hadley, MA, October. “Food, Health and Law,” Mount Holyoke College, South Hadley, MA, May 2011. Indigeneity in the Courtroom: Law, Culture, and the Production of Difference in North American Courts. New York: Routledge. The central question of this book is when and how does indigeneity in its various iterations –cultural, social, political, economic, even genetic –matter in a legal sense? Indigeneity in the Courtroom focuses on the legal deployment of indigenous difference in US and Canadian courts in the late 20th and early 21st centuries. 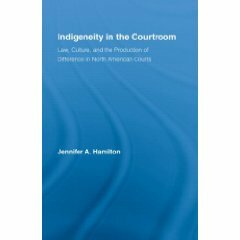 Through ethnographic and historical research, Hamilton traces dimensions of indigeneity through close readings of four legal cases, each of which raises important questions about law, culture, and the production of difference. She looks at the realm of law, seeking to understand how indigeneity is legally produced and to apprehend its broader political and economic implications. n.d. “The Mating Life of Geeks: Love, Science and the New Autistic Subject,” with J. Couperus, B. Subramanium, and A. Willey. Under review at Signs. 2012 “The Case of the Genetic Ancestor,” in Genetics and the Unsettled Past: The Collision of DNA, Race and History, eds. Keith Wailoo, Alondra Nelson, and Catherine Lee, 266-278. New Brunswick, NJ: Rutgers University Press. 2011 “The Case of the Genetic Ancestor: DNA Ancestry Tracing, Legal Subjectivity, and Race in America.” In Genetics and the Unsettled Past: The Collision of DNA, Race, and History, edited by Keith Wailoo, Mia Bay, Alondra Nelson, and Catherine Lee. Rutgers University Press (forthcoming). 2011 “Anthropology Becoming…? The 2010 Sociocultural Anthropology Year in Review,” with Aimee J. Placas, American Anthropologist, 113(2): 246-261. 2009 “On the Ethics of Unusable Data.” In Fieldwork Is Not What It Used To Be: Learning Anthropology’s Method in a Time of Transition, eds. J. D. Faubion and G. E. Marcus, 73-88. Ithaca, NY: Cornell University Press. 2008 “Revitalizing Difference in the HapMap: Race, Biomedicine, and Contemporary Human Genetic Variation Research,” Journal of Law, Medicine & Ethics, 36(3): 471-477. 2008 “DNA Data Sharing: Research Participants’ Perspectives’, with Amy L. McGuire et al., Genetics in Medicine, 10(1): 46-53. 2007 “Sumptuary Kinship,” with James D. Faubion, Anthropological Quarterly, 80(3): 533-559. 2006 “Resettling Musqueam Park: Property, Landscape, and ‘Indian Land’ in British Columbia,” PoLAR: Political and Legal Anthropology Review, 29 (1): 88-109. “From Practice to Substance: The Emergence of ‘Ethical Provenance’ in Contemporary Human Genetic Variation Research,” manuscript in preparation. “‘Frozen Moments’ in the HapMap: Some Ethnographic Speculations on Race, Human Genetic Variation Research, and Biomedicine,” manuscript in preparation. “HapMap Stories: Anthropology and Ethics After the Genome,” book manuscript in preparation. Political and legal anthropology; law and society; anthropology of biomedicine and bioethics; new kinship; theories of culture and identity; critical race and gender studies; the politics of indigeneity; ethnography of Canada, the United States, and Native North America. I have been developing two distinct but interrelated research projects, both of which are generally oriented around the role of genomics in society, and in particular, explore relationships among law, medicine, and the life sciences. The first, The Vitality of Difference: Post-HapMap Genomics and Ethics seeks to understand the current state of human genetic variation research and its broader social and political implications. The second, The Case of the Genetic Ancestor: Genomics, Legal Subjectivity, and Race in America, explores the shaping of legal identity in relation to new consumer genetics technologies. In support of these projects, I have received faculty development funding from Hampshire and, in the case of the latter, a fellowship from the Marion and Jasper Whiting Foundation. I am currently developing a book manuscript, tentatively titled A Place to Stand: Law and Science in a Post-Genomic Age, which explores the dynamic tension between science and law through an investigation of legal standing claims in US courts.